Specializing in sunlight is a life’s work for John Marston of Marston’s Tree Service. Since he was a teen, he has been working with trees and now as owner of one of the largest tree service companies in Maine, he takes pride in helping customers with their tree issues large and small. Marston’s is able to get into many tight areas to trim trees high in the air. The company is in the process of purchasing a spider lift that goes 70 feet in the air. 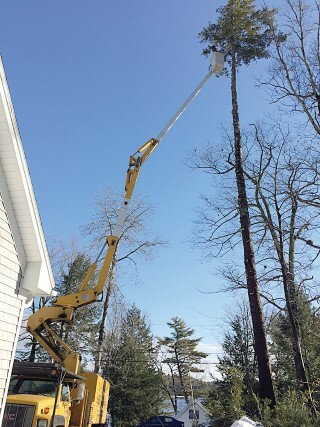 Marston’s works all over Maine doing commercial tree jobs. He is currently taking bids for commercial landscaping accounts, as well as working for the State of Maine doing tree work. They are always ready to bid on corporate jobs. On the residential side, Marston’s will come to inspect the work first. They offer free estimates and advice. Sometimes trees don’t need to be taken down, but instead just need to be trimmed. They are well versed in waterfront rules and regulations and will help get permits to have trees taken down. “We love a difficult tree job with crane work. But, there’s no job too big or too small,” he said. In 1998, Marston opened the business in Naples, where it is still headquartered today. He now owns a redemption store and has a towing company in Naples that is AAA certified. Marston’s receives a lot of customers by referrals from other customers. “We do everything to do with trees.” He’s a licensed arborist, EHAP certified to work around electrical wires, first air certified and insured. They are in good standing with the Better Business Bureau. People should make sure that the tree service company they hire are licensed and insured. They need to show a proof of a policy on the customer’s property, Marston said. “You shouldn’t have someone working who’s not covered,” he added. They have a 24-hour emergency call line that Marston staffs. He is the detail keeper for all of the businesses. He no longer works in the woods due to medical issues, but he is still involved in the day to day operations of the business. “I always like to know what’s going on,” he said. “We’re family-owned and operated. My son works for us, my son-in-law works for us,” he said. None of the wood that Marston’s process goes to waste. Each part is recycled for mulch, pellets or firewood. The company has 16 employees and is hiring more tree professionals. All of the top employees are licensed arborists, Marston said. Additional services consist of stump grinding and chipping as well as spring and fall clean-ups. In the winter, they offer full service snow removal services including snow plowing, sanding and salting services. Marston’s main office is at 212 Roosevelt Trail in Naples. Marston’s Tree Service can be found on Facebook, where clients can see many of the jobs they have done, on LinkedIn and at www.marstontree.com. For an appointment, email treework@yahoo.com or call 693-4631 or 888-332-1640.